Activist and lawyer, Mr. Prashant Bhushan, in a letter addressed to Mr. Anil Kumar Sinha who was appointed as the new Director of the Central Bureau of Investigation last month, has alleged “conflict of interest” that might exist with regard to dealing with the complaint filed by Mr. Bhushan against Justice C.K. Prasad. 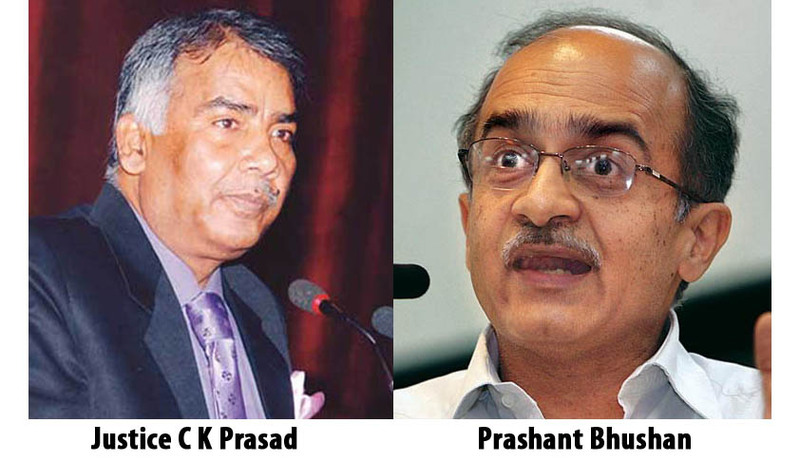 Mr. Bhushan had filed a complaint with the CBI on 01.12.2014 alleging abuse of office and criminal misconduct by Justice C K Prasad when he was the Judge of Supreme Court.Mr.Bhushan complaints that CBI is yet to register an FIR or RC in the matter. He hence, alleges that the “inaction of the CBI is in contravention of the Criminal Procedure Code and the Supreme Court judgments. Mr. Bhushan alleges that CBI Director’s close family member was one of the lawyers for Mistry Constructions in the same case which was disposed of in favour of Mistry Constructionsand the new letter asks about the truth of these connections and also asks the CBI Director about his course of action to deal with the conflict of interest and demands a response from the CBI Director as soon as possible. Earlier in December, in a letter to the central Vigilance Commission, had requested that the matter should be investigated thoroughly and impartially by CBI after registering an FIR. He had also sent a similar complaint to CBI. A week before that, Mr. Bhushan had addressed a letter to Prime Minister Narendra Modi, demanding that an independent body should be set up which would exclusively deal with the appointments of retired Judges to important offices. This step will, it said, “restore the trust of people in the credibility of various offices and the judiciary.” Read the LiveLaw story here. This letter by Mr. Bhushan referred to a letter written in February by Senior Advocate Dushyant Dave, who is currently the President of Supreme Court Bar Association, to the then Chief Justice of India, P. Sathasivam, which stated that Justice C.K. Prasad while hearing a Special Leave Appeal (crl) no. 7232/20113, ordered to list Civil Appeal no. 9454-3455/2013 (though he intended that Civil Appeal no. was 9454-9455/2010 be listed) as the matter were of similar nature on his own and without any of the counsels asking for the same. On the next date of hearing when matter came up on board, civil petitions were not listed because of wrong civil appeal no. being mentioned in the previous order. The court again ordered to tie up the matter as urgent. When both of the matters when came up for hearing on 25th February 2014, at the outset itself, Justice C.K. Prasad who was heading the Bench, accepted the submission of Senior Advocate C.U Singh, that both the matters were not connected to each other. Despite, there being no connection, civil appeal no 9454-9455/2010 was taken up and in the absence of any effective representation from City and Industrial Development Corporation of Maharashtra (CIDCO), the civil appeal was allowed without any debate. This was despite the fact that settlement was rejected earlier by a different Bench of the Supreme Court through an order dated 25.04.2013. This had led to Mistry Construction obtaining the respective tender and 35 hectares of prime land worth hundreds of crores which was rejected by the Bombay High Court. Dave’s letter had raised several questions such as how did the Bench become aware of Civil Appeal when the matter had never crossed its path and how could the Bench pass a suo motu order without the presence of the Counsels. It also concerned itself with the procedural defects while tagging the two appeals together and the “violation of judicial propriety and decorum” visible in the incident. The matter had raised significant legal and ethical questions, even compelling lateJustice V.R. Krishna Iyer and Justice K T Thomas to write to the Chief Justice of India, urging him to take suitable action regarding the allegations in Dave’s letter. Read Justice Krishna Iyer’s letter and Live Law’s coverage of the same, here. The controversy was however, put to rest in September, for a short period of time, by a Supreme Court Bench comprising of Justice Chelameswar and Justice P.C. Ghose, after they dismissed the Review Petition filed by City & Industrial Development Corporation of Maharashtra (CIDCO) and had indirectly dismissed Dave’s allegations. Read the Live Law story here. This may be one of the rarest occasions in the History of Indian Judiciary in which Judicial actions are being challenged through an independent proceedings and the legality of which is being debated in the legal circles. The Lawyers point out that if such complaints are there, the in house procedure published by the Court recently ought to have been followed at the first instance, than approaching an external agency.